So this is where we are as things stand with the new reduced alphabet. 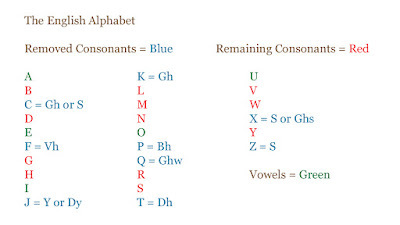 In this post I'm going to trial this new alphabet. I've got the feeling it's going to be fun. Before that though I should firstly mention the letter Y and the way it's sometimes used as a vowel as well as a consonant. As in words such as very or every, etc. In fact, I will do a post looking at vowels at some point to see if some changes can be made there as well. As for Y I've decided that from now on I'll be using it exclusively as a consonant. So words like very will be rendered with actual vowels in place of the Y. Veree or Verie being possible replacements for example. To trial the new alphabet I'll render a few famous verses in it. I'll start with a verse of the song Imagine by John Lennon. Quite crazy, and a few obvious problems immediately spring up. That's before we even get to the "push" consonant sounds. Firstly, in the very first line we now have a double H with the word dhhere (there). It looks a little bizarre, but I suppose for the time being I can't see any obvious reason why such a repetition can't be allowed. So I'll come back to this later. Sounds like Th and Ch (we had problems with the word much in the first blog series) were always going to be problematic, and it might be worth considering them separately. Another problem which sprung up concerned the replacement of the letter Y when it's used as a vowel sound. I hadn't thought about words such as sky and today. The "y" in sky sounds like the word eye, and an obvious replacement doesn't spring to mind. Of course "eye" sounds like how we pronounce a capitalised "i" ( I ) - however, we generally don't use it to represent this sound in the English language (except with words like iPad or iPhone, or when we use "I" to refer to ourselves). As for the "y" sound in the word today, that, in combination with its accompanying "a", sounds like a capitalised A. However, again we generally don't use an "a" to represent this sound in writing. So adequate solutions are needed. Hopefully I'll address these in my post about vowels. For the time being though I think I'll use "i" to signify the sound "eye", and a double "a" (aa) to signify the "A" sound. Not ideal, but it'll do for now. In fact, I'll think it may be wise to interject now and do the article about the vowel sounds before we proceed any further with the consonants. Next Up: How Many Vowel Sounds Do We Actually Need To Represent?